A KRM exclusive! Each of these gourmet chocolates contains a unique solid center handmade from a secret blend of fruit, chocolate and real wine. 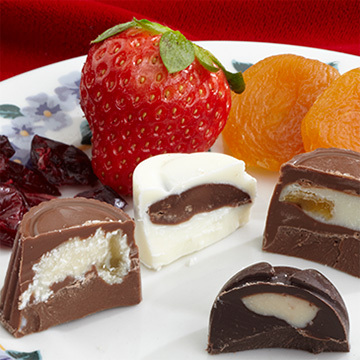 Available in three different, tantalizing flavors -- or as an assortment -- our Fruit & Wine Chocolates are perfect for hostess gifts, parties or as an anytime treat. One of the most unique gourmet chocolate gifts online! 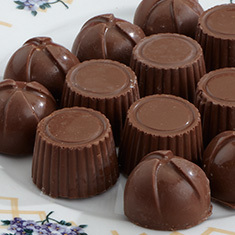 Mmmmmmmmmilk chocolate delicacies with a solid center of delightfully fruity, real peach wine combined with chocolate - and pieces of peach to complete your indulgent journey! Sold in boxes of 9 pieces or 18 pieces. 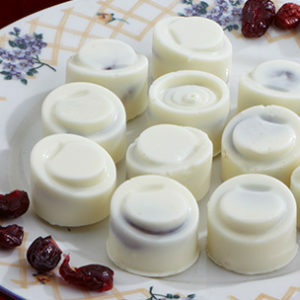 Irresistible fine White chocolate caresses a cache of real cranberry wine and chocolate in a solid center featuring sweet dried cranberries as a finishing touch. A taste-tempting gourmet confection! Sold in boxes of 9 pieces or 18 pieces. KRM brings the legend of Dark chocolate and strawberries as an aphrodisiac to a new level. 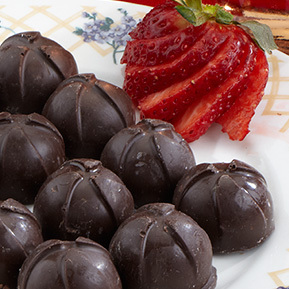 Each piece delivers a decadent filling of real strawberry fruit in a strawberry wine and chocolate solid center. Oh my! Sold in boxes of 9 pieces or 18 pieces. 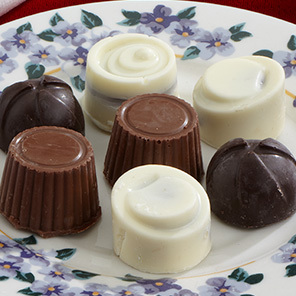 An assortment of all three varieties of our Fruit & Wine, solid-center chocolates. Sold in boxes of 9 pieces or 18 pieces.